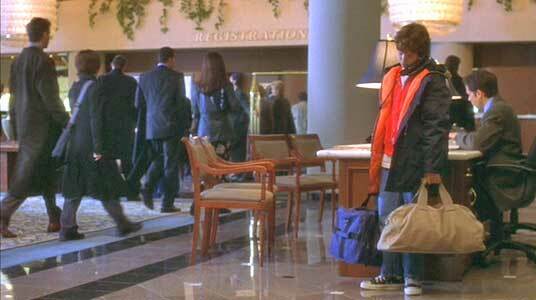 Ryan Gosling wears black high top Converse “Chuck Taylor” All Stars in the film. Pearl Madison and Leland have many interesting conversations. The United States of Leland is a story of suburban angst in today’s world, and the film seems to be meant as more of a character study than a crime and mystery type of film. The story is told in a combination of narrative by the principal character Leland Fitzgerald (Ryan Gosling) — who seems to be on the surface a sensitive and laid-back teenager — present day action, and flashbacks that are used to reveal details about Ryan and other supporting characters in the film. The film focuses on two families living in a comfortable southwestern suburban neighborhood. Ryan’s family consists of his somewhat distant mom, Marybeth (Lena Olin), and his famous father, noted author Albert Fitzgerald (Kevin Spacey). Albert and Marybeth have long been separated, and throughout his life Ryan has lived apart from his father, who prefers things that way. Albert’s idea of involvement in the family is to send round trip airplane tickets to Leland once or twice a year to travel to places like Paris and Venice (where Albert has been living) but most of the time he never even meets up with Leland. Despite this family rejection, young Leland is successful in meeting up with other people, often strangers like the well-to-do Calderons in New York City who take him in to their house on one of his trips. The other family is the Pollards, consisting of parents Harry and Karen (Martin Donovan and Ann Magnuson), two daughters, Julie (Michelle Williams) and Becky (Jena Malone), an autistic son Ryan (Michael Welch), and Julie’s live-in boy friend, Allen (Chris Klein), who has been living in the Pollard household for the past year since his widowed mother passed away. Julie and Allen are now seniors deciding on whether to continue their relationship, which has been serious for several years, when they go off to college. To make things even more complicated, Becky has been dating Leland for the past year or so, and the two of them often watch out for Ryan. We also soon discover that Becky is falling into a secret life of drug addiction, which she has been hiding from Leland and her parents. Leland and Becky watch over Ryan, Becky’s autistic younger brother. The somewhat placid lives of these two families is soon thrown into turmoil, when for no apparent reason, Leland stabs young Ryan to death in the park, and when he is later arrested for the murder, tries to explain that his reason for the crime was “he couldn’t stand the sadness anymore.” Since Ryan is only fifteen, he is remanded to the custody of the juvenile authority where he meets Pearl Madison (Don Cheadle) a counselor and teacher in the juvenile system who sees this as an opportunity to fulfill his goal as an aspiring writer and produce a book about Leland’s life story. Prison rules don’t permit inmates to have writing materials in their cell areas, but when Madison sees that Leland likes to write and talk about his situation, he encourages him to keep a journal of his thoughts and ideas. He even shows young Leland how to smuggle a pencil out of the classroom area in his sock, and where to keep the journal (which is a history workbook) in his prison uniform so it won’t be noticeable by the guards. Pearl Madison then begins to be proactive in trying to make his dream of gathering the material for a great book come true. He seeks out and meets Leland’s father, Albert, in a bar, in one of the more interesting scenes in the film, and encourages Leland to talk to him about his situation. But both Fitzgerald’s quickly see through Madison’s motive. Albert rebuffs him from a literary point of view, revealing also that he is interesting in writing a book about this situation, while Leland begins to make Pearl look at his own lack of moral behavior in dealing with him and his own personal relationships with women. Meanwhile, at the Pollard household, things have become desperate for the family. Harry and Karen are very distraught over Ryan’s death — nothing seems to make sense about it to them — and they lash out at reporters covering the story and at the Fitzgerald family for not raising Leland properly. Becky’s continued slide into drug addiction had caused her to break up with Leland so she could spend more time with her drug pusher boy friend. Julie has decided that her relationship with Allen has become too smothering, and she tells him that she wants to break it off. Allen faced with the seeming loss of the only “family” he has left, decides to take matters into his own hands, as a way to perhaps get back into the good graces of the Pollards. How all of these story threads come together and interact makes up the balance of the story. Leland often went on trips around the world by himself, financed by his father. While The United States of Leland explores a lot of characters and provides some interesting characterizations, ultimately it is the portrayal of Leland’s character that determines the success of the screenplay. On the one hand, Leland is supposed to be a vicious killer, capable of stabbing an autistic boy 20 times. On the other hand, Leland is an old soul in a young body, sensing the frustration in people’s lives, empathetic to the foibles of people, and wanting to help people get along and be happy. How can these two contradictory personalities exist in the same person? This is where the screenplay ultimately fails, because while we get a lot of the “kickback” Leland, we see none of the evil side. Stabbing someone is a crime of passion, especially for a fifteen-year-old, and there seems to be little of that expressed in the personality of Leland that we are shown. In fact the only specific details of the crime itself are divulged by others, and on screen the crime is expressed through a few blood stains and handheld videotape stumbling across the park to discover the body. In the screenplay, Leland seems to be the only character who has real empathy for poor Ryan, giving him friendship in the couple of brief scenes where you see them together that is not based on pity but just a desire to hold out a helping hand. So the big question remains, “Why?” If Leland’s views on life are so existential and accepting, why would he want to kill anyone, especially someone young, and although impaired, not harming anyone else or apparently suffering any physical sickness or muscular limitations? If there is evil in Leland or a fanaticism that would cause him to kill the way he did in the film, it would have to come from somewhere. Nowhere in the screenplay do we see any behavior or thought-process from Leland that explore this. The closest we get are some narration overs that say things like, “If you ask me, the devil makes more sense than God does. I can at least see why people would want him around. It’s good to have somebody to blame for the bad stuff they do.” While Leland admits that he knows right from wrong, when it comes time for him to discuss the murder he committed, all we get from Leland is that he couldn’t stand the sadness any longer and that he doesn’t remember a thing about committing the crime. If a “prevailing sadness” was meant to describe Ryan’s life, why didn’t Leland just spend more time with him if he wanted to help him. Probably Ryan’s biggest disappointment in life was not having the capability for real friends or companionship. But there are a lot of normal people who fall into that category. And that type of situation would normally be a root cause for suicide not homicide. Leland hides a pencil in his sock, so he can write in his cell. The credit/blame for the success/failure of The United States of Leland belongs to writer/director Matthew Ryan Hoge. While there is much to admire in his first released major film, perhaps he has fallen into the trap that many first efforts have where there is only one person directing all of the creative elements. It might have helped him to step back and look at the overall result of the project, as the sum of all the parts doesn’t add up in this screenplay. 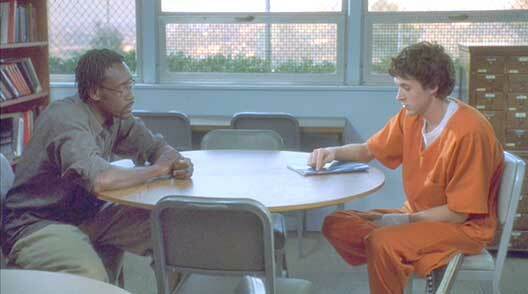 Hoge was fortunate to have a good cast at his disposal; both Don Cheadle and Kevin Spacey give us first rate work. With these major actors present, it would have been nice to get a few more revelations from the Spacey character to help define Leland Fitzgerald’s motivation or at least present one father-son scene. And it would have been more pertinent to the plot if Don Cheadle spent more time exploring the dark side of Leland Fitzgerald rather than talking about his own affairs and infidelities. One would imagine that Ryan Gosling got the part of Leland Fitzgerald due to his work in Murder By Numbers, where he did portray a psychopathic teenager, although you never see any of that type of personality in the portrayal of Leland. Nevertheless, there is still much to admire in his performance and narration throughout the film, and you have be grateful that devoted chucks-wearer Leland seems to be more typical teen than typical murderer. It is a stretch to believe that Gosling is only fifteen in this story considering that he was 23 during the filming. The United States of Leland is well-made, has some interesting characterizations, good acting, and stimulating dialogue, but when all is said and done you still aren’t quite sure what message it is trying to convey. A drop of blood falling on Leland’s chuck is the only indication that a crime has been committed. Ryan Gosling in his role as Leland Fitzgerald wears black high top chucks throughout the film in regular life and in prison, as does Alec Medlock, who briefly plays Leland when he was twelve years old. Clearly Leland was a committed chucks-wearer throughout his brief life. There are a few good close-up shots; one of the most telling when we see a drop of blood fall onto Leland’s shoe after the crime was committed (we never see it in the film), although it is unclear whether it is blood from the victim or from Leland. 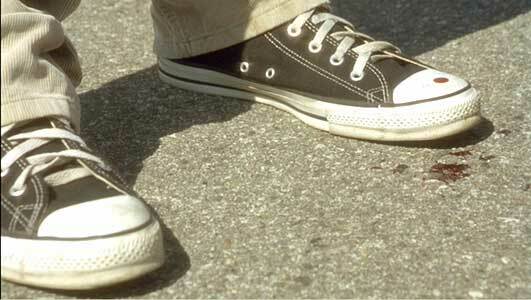 There is one close-up scene that has to fall into the category of a goof, where you see a pair of worn black high top chucks, supposedly Leland’s shoes outside his cell door, but they are an older vintage model with different side stitching, laces, wider white rubber foxing, and wider black piping, not like the more modern pairs that Ryan Gosling wears throughout the film. You also see in each of the close-ups that the shoes are laced differently. These are a vintage pair, older than the ones worn in the film, probably belonging to the props department. The United States of Leland. (2003) Ryan Gosling, Don Cheadle, Chris Klein, Jena Malone, Lena Olin, Kevin Spacey, Michelle Williams, Alec Medlock. Written and directed by Matthew Ryan Hope. Categories: Drama, Crime and Mystery.